While many people relate winter time to relaxing in a recliner, watching football, eating popcorn, and waiting on Spring Time – some of us relate winter time to catching some trophy sized fish. Here on the Upper Texas Gulf Coast, we may see air temperature swings from 15 to 25 degrees often. Winter fishing techniques may change some, but the fish are here. We have resident fish that never leave our bay system, and though the fishing presentation is adjusted… the fish still must eat. First let’s talk speckled trout. Speckled Trout are cold blooded creatures, and their body temperatures is near that of the water. When the water temperature falls – their metabolism falls. When the temperature rises – their metabolism will rise, and they eat. Water temperatures in the mid 50’s and higher – Speckled Trout will become active and feed up. When the temperature falls below 52… things get slow. It doesn’t mean the fish aren’t hungry… it is just their cold-blooded bodies don’t have the energy to make it happen. The energy they do store… they hold until their bodies heat up a bit. How do their bodies heat up? Water temperature rise – metabolism increases, and speckled trout will eat. These swings in water temperature are the key to catching most fish, and speckled trout are top of the list. 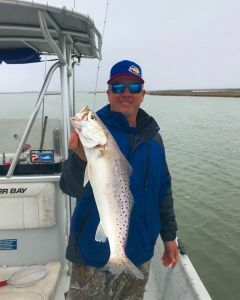 On our Galveston Fishing Charters, we may change the areas we fish for speckled trout in the winter… and slightly change the technique. Back in the marshes, we will key on deeper guts, drop offs, and “holes”. Deep canals will also hold the fish. One of the many great things about winter time trout fishing is when you find them… they very likely are stacked in there. Bayous that have mud flats adjacent to the deeper channel will also hold fish once the sun gets up and surface temperature increases. When you see mullet begin swimming along the shallow mud flats – it is almost a guarantee there is something following them up from the deeper guts to feed. I feel the redfish are usually the first to hop up onto those shallows after those bait fish – but the speckled trout will not be far behind. My Dad’s favorite fish to catch was the red fish. I cannot begin to tell you how many thousands up on thousands of hours we spent fishing the marshes of West Galveston Bay – 12 months out of the year. Should Dad have ventured out to other parts of Galveston Bay some of those months? Yes. However, my Dad loved the solitude of the back bayous and bays – and we caught fish all year. Now, some months were better. Those months were during the Fall and Winter. Dad was mainly a live bait fisherman. A live shrimp under a popping cork was the down fall of many, many red fish throughout my Dad’s fishing life. I do remember one winter day, and none of the bait shops had live shrimp. Dad and I were determined to get out on that sunny, but cold day and wet a line. Back in the early 80s, there weren’t the millions upon millions of soft plastics and colors to choose from like we have today. If there were, Dad didn’t have them. Dad did have maybe four different colors of the ever-famous Kelly Wiggler Shrimp Tails and a handful jig heads – and we took off. I think Dad had a glow color with bright orange tail, strawberry with a white tail, root beer and white tail, and…. Come to think of it, we had three colors to choose from and some heavy jig heads. See we also didn’t have these fancy reels that make it easy to throw a 1/8 oz jig head 40 or 50 yards. Nope. Abu Garcia 5500c was our top of the line reels, and we could cast ‘em. So, let’s get back to the trip. No trolling motor. No waders. Just an old center console boat, an anchor, and a Dad and his young son that wanted to go winter time fishing. The sun was shining bright that winter day. I don’t exactly remember the temperature, but it was in the low 60s. We didn’t get an early start… maybe mid-day. Dad cruised that boat down the bayou (wide open throttle is all Dad knew), and I hid behind that windshield with him anxious to see what we could do with no live shrimp… My expectations were not very high. We pulled upon a shallow mud flat. This flat had (and still has) cedar trees on the shore line with their branches draping the water, and back then a duck blind in the corner of the flat. I eased the anchor real quiet onto the 2-foot-deep mud flat, and we started chunking and working those Kelly Wigglers like pros. Within only 30 minutes we had 3 keeper sized red fish, and a couple just shy of the back then 18” minimum. I am not sure who was more surprised, Dad or Me! We fished three or four of those flats that day and built a box of red fish and a couple bonus flounder that we were so proud of. I didn’t realize it then, but that day taught me something that I would reflect on once I got out on my own with more than a box of Kelly Wigglers. That winter day Dad and I fished those flats with such great success still works today. The sun was shining. The water temperature was on the rise… and a Dad and his son were wanting to go fishing. Many things have dramatically changed in today’s world from when I grew up fishing in the 80’s as a kid with his Dad. I can tell you one thing that has not changed dramatically…The fish still call the same areas home year after year and spawn after spawn. Water temperatures fall. Water temperatures rise. Fish Eat. You just gotta go fishing! 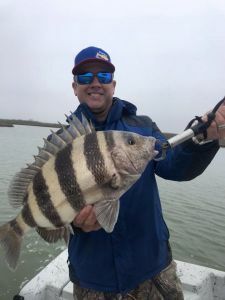 Winter time fishing in Galveston Bays can be incredible. Give us a call if you want to get out and do some fishing this winter. 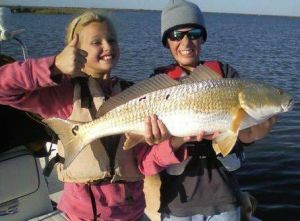 There are many opportunities from the back lakes and bayous, jetty fishing for Bay Snapper, Red Fish, and trout, and flounder gigging. Give me a call for some winter time specials at our Fishing Lodge – Bay’s Landing. Heck, you can watch the football game after a day of fishing from Bay’s Landing. Get out of the recliner, call or email me and let’s go fishing.